We rely on electronic devices more than ever before. Lights, cell phones, computers, televisions, sound systems, and even many appliances and HVAC systems run on electricity. Unfortunately, many homes simply are not able to keep up with the demand. Upgrading your main service panel is the most effective means of solving this problem. At Rowell’s Services, we offer main service panel upgrades and circuit breakers in Northfield, New Hampshire, and the surrounding areas, and we would be happy to help make sure your home can keep up with your family’s needs. Even if your home was built just 10 years ago, it probably wasn’t designed to handle the electrical demands of today. Upgrading your main service panel is the best way to make sure your home can accommodate all the electronics you use every day. Whether your home is already struggling to keep up with demand or you are renovating or planning an addition, panel upgrades are necessary to power additional circuits. Circuit breakers are designed to prevent short-circuiting and electrical overloads. At Rowell’s Services, our licensed electricians are certified to inspect, repair and replace circuit breakers as necessary. 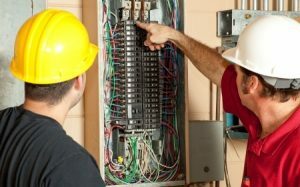 If you are having problems with a breaker that trips constantly, we can determine the problem and recommend the best solution. We’re also here to help you add additional outlets. When you need a helping hand with main service panel upgrades and circuit breakers, trust the expert electricians at Rowell’s Services. To schedule an appointment with a licensed electrician, please call 603-934-4145.